Oud bakhoor on a golden burner, with traces of smoke and animal leather. Exotic and prized oud blended with labdanum and dark patchouli. 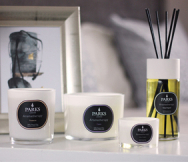 For Parks Platinum, our founders (Carol & Sidney) travelled the globe for exquisite scents to combine with classic British design. Selecting only the finest ingredients, the result embodies our decades of candle-making experience and love of fragrances to deliver the luxury of an exquisitely scented space into your home. The moreish gourmand of Bourbon & Maple; the comforting blend of Feu de Bois and seductive Dark Rose – these are just some of the highlights from Platinum that also features Parks Original; the fragrance that started it all.